Ryntaing from the Gaelic Roinn-Teanga (the point of the tongue). A pont of land at the junction of two burns. The farmstead of Ryntaing, which was abandoned earlier this century, comprises a U-shaped steading facing SE with a farm cottage to the SE. The cottage, which still retains its slate roof and is in use as a bothy, measures 7.2m from NW to SE by 4.95m transversely overall. The interior comprises a single room with a fireplace in the NW wall, and the original entrance in the SW side has been widened. There is a single window on the SW. A short distance to the SE of the cottage there are the remains of a probable pig-sty, measuring 3.25m from NE to SW by 3.1m over mortared stone walls. 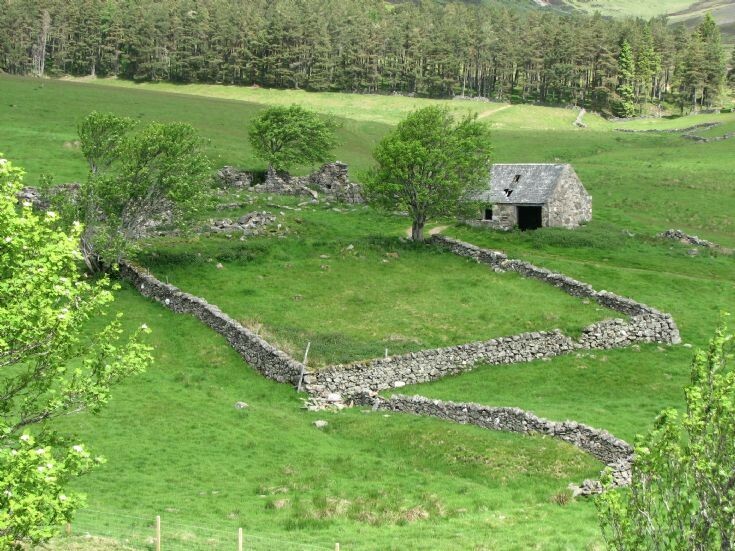 The steading comprises a byre (14.7m from NE to SW by 3.7m overall) on the NW with two entrances into the court and its stone-lined square midden-hollow. A blocked doorway at the NE end of the byre, originally gave entry to the upper end of the threshing barn that forms the NE side of the court. Measuring 18.9m from NW to SE by 5.3m overall, the barn is subdivided into three compartments. A wheel-pit (0.8m wide and 1.8m deep) is still visible on the NE side of the building with the water for the wheel having been originally supplied from a pond (now dry) immediately to the NW. The SW wing of the court comprises two sizeable buildings, that on the NW measuring 8.6m from NW to SE by 6.7m, and that on the SE 13.3m NE-SW by 5.1m overall; the gap between occupied by a small, two-bayed structure that is probably a stable. Visited by RCAHMS (JRS), 14 May 1997.